The incident is the latest in a spate of cash machine thefts at businesses across Northern Ireland in recent months. “We received a report around 3:25am that a digger was on fire outside a shop on Brook Street in the village, and that an ATM had been ripped from the side of the building causing considerable damage,” explained Detective Inspector Richard Thornton. 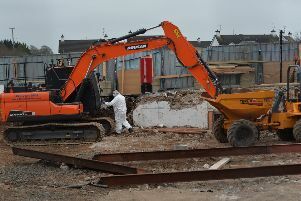 “We believe the digger was stolen from a site nearby. DI Thornton urged businesses to regularly review their crime prevention measures in order to minimise their risk of becoming a victim of crime. “I encourage those either using or storing heavy plant machinery such as diggers or telehandlers on sites, or facilities near commercial premises, to ensure that these machines are kept locked, secured and immobilised to prevent theft,” he said. Commenting on the latest ATM theft, Retail NI Chief Executive Glyn Roberts said: “Yet again we awake to the news of another disgraceful ATM robbery on a local independent retailer. “If the criminal gangs behind these ATM robberies are not stopped there is a real danger many rural communities will lose local access to cash. They are attacking local family-owned small businesses which are the backbone of the rural economy, providing an invaluable service to the local community.